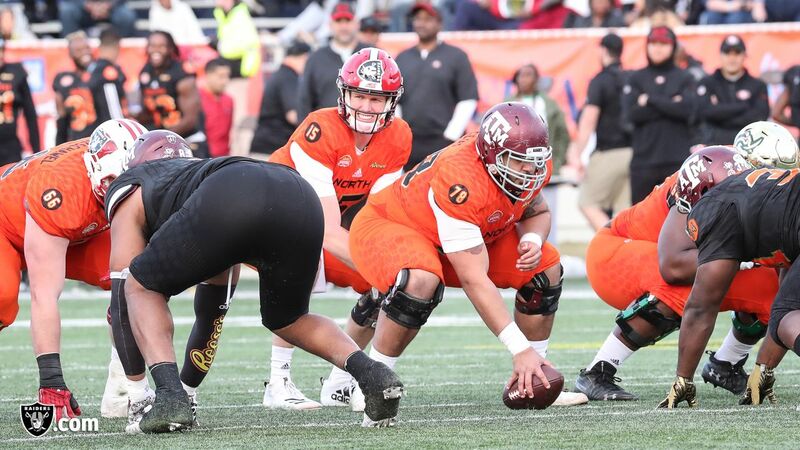 The 2019 Senior Bowl provided a lot of interesting tidbits last week and watching Oakland Raiders Head Coach Jon Gruden get excited about coaching a plethora of talented college prospects was fun to watch. The North All-Stars defeated the South All-Stars 34-24, and several players had standout performances. The beauty of the Senior Bowl is that it gives players entering the draft an opportunity to elevate their draft stock, and there were plenty of prospects that did just that during Saturday’s game. Nasir Adderley, DB, Delaware – From the moment we touched down in Mobile, Ala., there was plenty of buzz regarding Adderley. The six-foot, 200-pound defensive back registered four interceptions while at the University of Delaware, and he showed all week that he has ballhawk capabilities. During practice, Adderley picked off Duke signal-caller Daniel Jones, and he kept it going during the game by intercepting University of Buffalo quarterback Tyree Jackson. Adderley improved his draft stock significantly during Senior Bowl week, and it’ll be interesting to see where he’s drafted in April. Jaylon Ferguson, DE, Louisiana Tech – Ferguson was widely regarded as one of the premier pass rushers at the Senior Bowl. During his four seasons at Louisiana Tech, the six-foot-five, 262-pound defensive end totaled 67.5 tackles for loss, 187 tackles total, and 45 sacks, with seven forced fumbles. During Saturday’s game, Ferguson showed off his speed by tracking down Daniel Jones and sacking him. He was a player scouts wanted to see more from last week, and he impressed. Game action of the 2019 Senior Bowl at Ladd-Peebles Stadium, Saturday, January 26, 2019, in Mobile, Alabama. Daniel Jones, QB, Duke – Jones is expected to be a first-round pick, and several mock drafts even have him being selected within the top 10. Jones seemed to thrive the most among the four quarterbacks on the North roster, completing an efficient 8-of-11 pass attempts for 115 yards, and one touchdown. There are plenty of QB-needy teams in the draft, we’ll see who takes a chance on him. Andy Isabella, WR, UMass – If you saw him in person, Isabella’s five-foot-10 frame wouldn’t intimidate you, but on the field, he plays big. The athletic wideout hauled in seven receptions for 74 yards, and one touchdown, which lead all receivers in yards and receptions. Hunter Renfrow, WR, Clemson – The two-time College Football Playoff Champion has played in his fair share of big-time games, and he was clutch when the Clemson Tigers needed him most. During the Senior Bowl, Renfrow finished with the most receptions on the South team and added 63 yards. He wasn’t the most-talked-about wide receiver at the Senior Bowl, but he made an impact on the field all afternoon. Tyree Jackson, QB, Buffalo – Jackson hasn’t received nearly as much coverage as Daniel Jones, or Missouri’s Drew Lock, but he’s an intriguing prospect that has people talking. He had a strong career at the University of Buffalo, throwing a career-best in touchdowns with 28, and wasn’t afraid to put the ball on the ground and do it himself. Jackson rushed for 757 yards and 16 touchdowns during his career. He had a strong outing for the South team, completing 61 percent of his passes for 165 yards, two touchdowns, and one interception. Just watching the Raiders coaching staff interact with the players was exciting, and you could tell that fun was being had by everyone. Even though the emphasis is on helping these players reach the next level, and furthering your development, making sure they love playing the game is the priority. Gruden said during his press conference last week that he and General Manager Mike Mayock would be looking for players that met the “Raiders Star” criteria. Whenever a player made an outstanding effort on Saturday, Gruden or a member of the coaching staff would slap a Raiders sticker on the side of their helmet to let them know they did a good job. This kept the players motivated and engaged in the action all afternoon; take a look. We’ve got a couple weeks until the NFL Scouting Combine in Indianapolis, but the Senior Bowl benefitted a lot of players draft stock, and we’ll see if they can build on it at the Combine.